One of my 2012 New Year's Resolutions was to be more like a friend of mine, Ken Calman, and share more of my flying adventures online. Ken's unexpected passing has vaulted that promise up my list of things to do. It's going to take a bit to get used to this as a regular process, but I hope you all enjoy. This last month has been quite tumultuous for my family. We suffered the tragic death of my aunt that was visiting here on vacation. Taking care of all the multitude of issues surrounding that event has been extremely time consuming and mentally tasking. As a result, I wasn't able the get the Eagle ready for IAC 67's Acro Camp for my partners. They're all quite nice about it, but I still feel I let them down. But now the Eagle is flying again, one last little project of replacing the oil door rivets and she'll be fit for acro. The wheel pants will take a while longer, but that can wait. I have been flying between Renton and Everett a few times getting ready for Paine Field Aviation Day that was on May 18th. Other than the weather forecasters scaring away a good number of our expected guests, the event was a great time! I had a lot of fun working with my friends, and two of the best announcers in the business, Roy Hafeli and Ken Hildebrandt of H2A2 Air Show Announcers. They just ROCK! So here we are at the beginning of June, and as I look at my calendar for the next four months, there will be a whole lotta flyin' going on! So, in my last post I put the comment, "And once again, I'm embarking on a journey to build a flying aircraft." Yep, this isn't my first attempt, although the first one was basically youthful dreaming. Back in the 1980's I worked at the Museum of Flight in Seattle. Someone had donated a collection of sad looking parts that were supposed to be a helicopter. The MoF had little interest in the project and it was stacked behind the Red Barn under a tree and pretty much ignored. After a year or so I approached the MoF about taking on the project myself, transporting the collection of pieces home and restoring the helicopter to its former glory. They seemed eager to get rid of the "wreck" so I got the go ahead fairly easily. 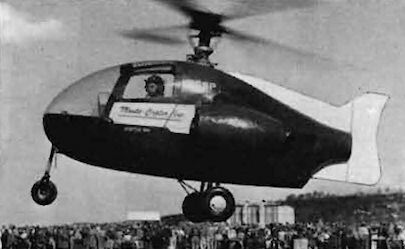 The aircraft was the Monte Copter Model 12, not really a household name. A local Seattlite by the name of Maurice Ramme believed the simplicity of "cold-jet" rotor tip drive technology would make the dream of "An aircraft in every garage" a reality. The exhaust of the engine is routed up through the rotorshaft and out the tips of the rotors. This eliminates the need for a tailrotor as there is no torque being applied to the main rotor. He built the Model 10 as a proof of concept vehicle. The Model 12 was more refined and designed to test various engines. Originally with a single O-290, 135hp piston engine, and later (as seen above) with two 160shp turbine engines. 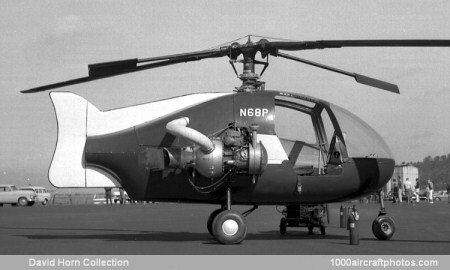 The end result was supposed to be the Model 15 Triphibian, an helicopter with wheels and a hull for water operations. It's Seattle after all, everyone has a boat! Of course I thought I could restore the aircraft to flight... How hard could it be? So I spent a summer cleaning parts and researching the design to find out as much as possible. Never was able to find any plans or drawings though. But that was a moot point, by mid-summer my father informed the family we were moving back overseas and there was no way he was paying for storage of the Monte Copter. Back to the MoF it went. They found a Boy Scout Troop that was interested in taking on the project, but when I returned from overseas, they couldn't find any contact info for them. So now it's 2013 and I have the Acro Sport project kicking off. Made me wonder what ever happened to the Monte Copter Model 12. The Internet is a wonderful tool, a quick search today found this picture from 2010. 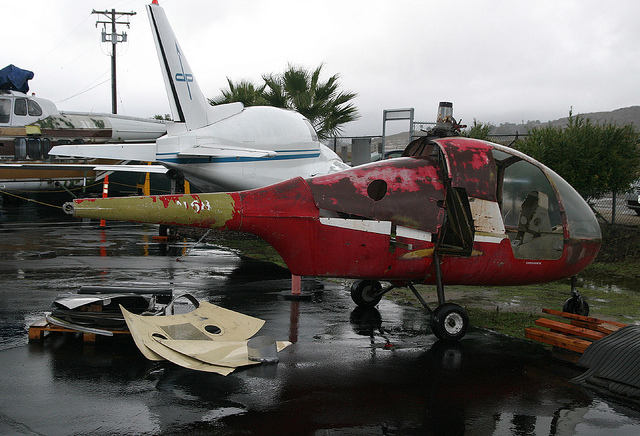 Both the Model 12 and the Model 15 are at the Classic Rotors helicopter museum in Ramona, California. From the picture, not much has been done since I last saw her. But I hope they do finish the restoration of such a unique aircraft. Lots of aviation activity this last week, three days of aerial event meetings in a row. All of them are struggling a bit with this sequestration crap, the loss of US Military support really hurts the bottom line. The average air show spectator comes out for that high tech hardware, 2013 is going to test our ability to make these events attractive for Joe Q. Public. The weather was good enough to fly to at least one of the meetings. It was a nice break in the work day. 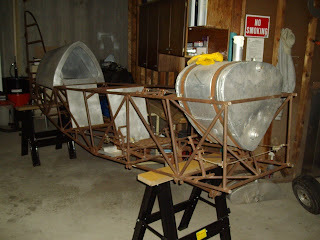 So, now I have a set of plans and fuselage sitting in my hangar next to the Wolf Pitts. And once again, I'm embarking on a journey to build a flying aircraft. The journey will not be swift, cheap or easy, but it will be gratifying. Last Friday after posting here I headed on down to Renton airport to continue the dis-assembly of Double Eagle. The group made a lot of progress over the weekend, getting the damaged gear off, and a temporary set installed, removing the wing and clearing the area for the welder to do his magic on the fuselage. I met with the welder this morning, it's going to be a bigger job than hoped to fix the left side tubing. He's bringing another experienced aircraft welder to the airport this weekend, hopefully we'll have an assessment thereafter on time and expense. The gear will be shipped out this week once Grove confirms they can fix our set. And we will be dropping off the wing with our A&P on Wednesday. There still are a lot of items to do for the condition inspection, so we'll be busy for a while. So the middle of last week I get an email from my friend Jerry asking if I would be willing to fly is Cessna 172 from Boeing Field to Ephrata to pick him up after he drops off his Extra 300 there for the season. The Northwest just rocks when the sun is out! I enjoyed playing with the new Aspen and Garmin equipment. Now that we have decided to upgrade the panel of N2134Y, perhaps I should make some suggestions. One last thought, on Friday I got on my soapbox about the pending tower closures. I received a couple emails from that post, one criticizing my point and saying other funding sources weren't an option. In this morning's aviation press I see an article about the Texas Department of Transportation having made the decision to fund the towers in their state that are on the chopping block. Yes, it is possible to keep the towers open, if the desire is there. There seems to be, as always, a lot of misinformation and sound bytes being bantered around about the pending closure of 149 control towers. Much of the blame in the public outcry, Washington DC and the press is laid upon the FAA's feet. However, that doesn't seem to be where it should lie. Yes, the FAA did cut funding for all the contract towers that aren't getting additional Congressional funding. But that doesn't mean the towers have to close. That just means the FAA isn't going to pay for them. You see, a tower does not have to be funded by the FAA. The controllers in these 149 towers are employees of a private company. That company could very well continue to offer controller services from other sources of funding. For instance, a city owned airport could continue the funding of a tower if they felt it was a necessity for their airport. When the FAA ceases funding for control tower operations, the airport operator has a choice. The airport operator may choose to operate as a non-towered airport. The airport operator may also choose to continue providing tower services as a non-Federal control tower. The decision made by the airport operator will most likely affect what happens with the existing tower structure and the equipment inside. So, bottom line is that it's not the FAA's "fault". If blame has to be assigned, look at the airport owners and companies that provide tower controller services. Unfortunately one of my partners took a wild ride while landing the Eagle yesterday, ground looped her on his second landing of the day. While he walked away no worse for wear (thankfully! ), Double Eagle has been admitted to intensive care for some first aid. Initial inspections show that we need to replace the gear, wheel pants, one wheel, and all the gear mounting hardware. The right wingtip scraped along the ground for a bit, so at least some fabric work will be needed. I stuck a bore-scope through a rip in the fabric to see if there was any damage, didn't see anything of significance. But a closer look will be needed at the spar and aileron attach points. Along with this damage, the fuselage tubing is broken on both sides by the landing gear. There is a suggested reinforcing of this area by the factory, I think it's time we do that mod. Even though it means taking the engine off the airplane. Hell, I did that with the Wolf Pitts six times last summer! Had a board of directors meeting for the Arlington Fly In yesterday and the weather was forecasted to get clear and sunny about half way through the meeting. Leaving home I checked weather and despite the cold, the ceilings were nice and high. Off to the airport, pulled out the Wolf Pitts and headed up to the meeting. Afterwards, one of the attendees, Mark Peterson, caught me on video leaving on my way home. It's a great 7 minutes showing the activities you see on a sunny Saturday here in the Great Northwest.